In Real Talk for Real Teachers: Advice for Teachers from Rookies to Veterans: "No Retreat, No Surrender!" ” Rafe Esquith, author of the New York Times bestselling Teach Like Your Hair’s on Fire, brings us back to his beloved Room 56 in Hobart Elementary School and offers advice and instruction for teachers of all experience levels (Viking; $26.95; ISBN: 978-0-670-01464-4; Strict On Sale: July 16, 2013). With his trademark humor and no-nonsense maxims, Esquith speaks with a level of candidness that teachers will find refreshing and reenergizing. With thirty-plus years of experience as a classroom teacher, Esquith has seen it all: hysterical parents, field trips gone awry, reluctant and unenthusiastic administrators, as well as students who have overcome tremendous obstacles, youth performances that parallel professional productions, and, of course, skilled teachers with years of experience of their own. 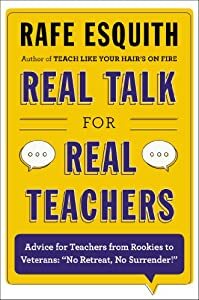 REAL TALK FOR REAL TEACHERS shares Esquith’s accumulated knowledge and opens up a frank dialogue about the often imperfect and incredibly challenging reality of being a teacher. Packed with entertaining classroom stories, practical instruction, and straightforward guidance, Esquith’s newest book has much to offer teachers at any point in their career. For new teachers facing the overwhelming and often nerve-wracking first few years of teaching, Esquith presents a jumping-off point. Educators in the midst of their careers will find much food for thought when they finally discover the “answers to questions that time did not permit to be asked during the early years of struggle.” For the seasoned teacher who has perhaps become discouraged by the mandated testing, administrative red-tape, and day-to-day frustrations of being a teacher, Esquith examines the role of the master teacher and shares ways to stay inspired and excited in the classroom. REAL TALK FOR REAL TEACHERS is just that—real. Teaching is not for the faint of heart and Esquith doesn’t bother to candy-coat its day-to-day realities. With his offbeat humor and from-the-hip advice, Esquith proves the perfect companion for teachers who need a quick pick-me-up, a long heart-to-heart, or just a momentary reminder that they’re not alone. Rafe Esquith has taught at Hobart Elementary School in Los Angeles for more than twenty-five years. He is the only teacher to have been awarded the president’s National Medal of the Arts. His many other honors and awards include the American Teacher Award, Parents magazine’s As You Grow Award, Oprah Winfrey’s Use Your Life AwardTM, the Compassion in Action Award from the Dalai Lama, Kennedy Center/Stephen Sondheim Inspirational Teacher Award, People magazine’s Heroes Among Us Award, and being made a Member of the British Empire by Queen Elizabeth. To find out more go to http://www.hobartshakespeareans.org. This was a book that all new teachers should definitely read and it is a book that will provide motivation and inspiration for seasoned teachers too. What I loved most about the book were the real life stories within the book that gave advice to all who read it. The book itself was straight-forward and to the point and gives down to earth strategies for any teacher who is trying to stay active and innovative no matter where they are in their career. You can truly tell that the book is written by someone who has been an educator for some time and the book is definitely one that will provide valuable guidance for new and old!